The Berlin Wall is probably the starkest visual symbol of the Cold War. It divided the western or “free” part of Berlin from the eastern part that was under East German authoritarian rule until it was famously torn down in 1989, marking the end of the Cold War and the unification of Germany. Some of the wall is kept intact as a memorial and a lesson for future generations to heed. But there is one part of the Wall that serves as a symbol of joy, not sadness. This is the East Side Gallery, a 1.3km section of the wall that is covered by 105 colorful graffiti artwork. There are caricatures, wacky abstract patterns, and fantasy figures. One of the most well-known graffiti artworks is a kiss between Soviet leader Leonid Brezhnev and Erich Honecker, president of East Germany, which was based on a real photo (which I didn’t know before). The graffiti painting actually has its own name “My God, help me to survive this deadly love.” The kiss was known as a socialist fraternal kiss, done by communist leaders as a greeting during the 20th century. Situated along the river Spree, the East Side Gallery is a very pleasant place to visit, not to mention it is completely free. As a plus, the nearby Oberbaum bridge, on which road traffic and subway trains travel, looks like a medieval castle with its two towers and Gothic style design. We usually think of geography as being about mountains, rivers and seas, but geography is also a major factor in how large or wealthy or powerful countries have become. Prisoners of Geography- Ten Maps That Tell You Everything You Need to Know About Global Politics uses geography in the form of maps to explain ten large countries and continents including the US, China, Russia, Europe, Africa, and even the Arctic. The author, longtime foreign correspondent Tim Marshall, utilizes his ample experience to write a compelling book that combines geography with history and international affairs. Starting with Russia, Marshall points out how the world’s largest country both benefits and is constrained by geography including plains to the west, limited access to oceans, and a vast resource-rich eastern region Siberia. The western plains is Russia’s most vulnerable area, being where invading armies from Europe such as the Nazis and Napoleon’s Grand Army have flowed through. As such, that is why it worries a lot about NATO expanding eastwards and specifically about the Ukraine. Meanwhile, the US status as the world’s superpower was aided by perhaps the most favorable geographic conditions such as large coasts facing the Pacific and Atlantic, a large interior, and the world’s longest network of navigable rivers such as the Mississippi. The latter might not be too well-known, but navigable rivers facilitate significant trade as goods can be easily and cheaply moved by ships. Conversely, Marshall points out, the lack of this can hinder countries and continents such as Africa and South America. The latter’s interior also has a lot of mountains such as the Andes range, that prevents easy rail and riverine connectivity. If you’re wondering about the Nile and Amazon, those are both mighty rivers but not conducive to large cargo-carrying ships. Europe was able to prosper greatly during the Middle Ages because of its large rivers like the Rhine and Danube which facilitated trade and commerce. However, not all European countries benefited from this. For example, Spain’s hilly interior and lack of large rivers meant it couldn’t develop as quickly as its northern neighbor France, which partly explains why Spain didn’t become wealthier than France. Prisoners of Geography is one of the most fascinating non-fiction books I’ve ever read. It is a fun read that also makes global affairs a little more understandable and the world a little less complicated. I enjoy reading about different countries, but Switzerland has never really struck me as fascinating. Sure, it’s famous for making expensive watches and has stunning mountains, but I’d always considered it to be a bland wealthy country, exemplified by its neutral status. However, my perception has changed thanks to Swiss Watching- Inside Europe’s Landlocked Island by Diccon Bewes, an English expat who moved to the country for love and now lives there. For one, I learned that the country is way more diverse than I’d imagined. For instance, Switzerland doesn’t have one single common native tongue, but four official languages- French, Italian, German, and Romansh, a truly indigenous language but mainly spoken in just one district. This means that the Swiss have different native tongues, depending on where they grew up, but will also speak one or more other languages, including English. The Swiss are also multi-religious with different parts being traditionally Catholic or Protestant, and they also have a large population of immigrants (21 percent according to Bewes). This multilingualism is a result of a history in which separate districts or cantons joined together gradually from 1291 whilst retaining a sort of independence. Over the centuries, this loose confederacy endured and solidified into a nation, whilst developing an identity that is both proud but does not rely much on national icons. For instance, there are no great Swiss kings or leaders, and even in modern times, the president is not that important – they only serve one-year terms! The country is also not part of the UN or the EU, and stayed out of World War II, though their banks did hold stolen gold for the Nazis. The Swiss do take their country seriously. For example, every male must do a period of compulsory military service, then is given a gun to keep at home for use in the event of war (I wish Taiwan would take defense as seriously). In their democracy, public participation plays a big role in the form of referendums. Two cantons even maintain the tradition of having public election meetings on one day every year where local matters are resolved by vote. Bewes describes familiar aspects of the country like its love for hiking (no surprise given its many mountains), its tasty chocolates, its craftsmanship as exemplified by its expensive watches, its banking service, and the national train service. However, he also points out contradictions such as how the Swiss are both resistant to change but innovative, and treasure their privacy but tolerate a strong level of government intrusion. In fact, Bewes says that this is what makes Switzerland so interesting and I would agree. There is a lot of interesting facts about Switzerland. For instance, it wasn’t always neutral as it fought wars with the Austrians, the Burgundians and others up until 1515. That’s when the Swiss suffered a bloody defeat to the French at a village called Marignano. The Swiss decided never to fight again as a nation, though that led to Swiss soldiers banding together and going around Europe to fight for other nations and kingdoms as mercenaries. The Pope’s Swiss Guards, who guard the Pope in the Vatican while holding medieval spears and decked out in resplendent uniforms, are the sole surviving unit of Swiss mercenary tradition. Also, Swiss people invented velcro, the division sign, aluminium foil, and the LSD (yes, the hallucinogenic drug). But not the cuckoo clock, which actually came from neighboring Germany. While the book is not a travelogue, Bewes does visit different parts of the country to showcase aspects like the 35-km Swiss Path in which every canton is represented; sites associated with Heidi, the country’s most famous novel, and its writer; and a factory where one can still see cheese being made. Besides the discourses on Swiss history, politics, society, and economy, Bewes fills the book with lots of humour but it’s clear he has a lot of affection for his adopted country. I admit Switzerland was not at the top of the list of European countries I want to visit, but having read Swiss Watching, it has now moved up a bit. I really like visiting museums, especially those that focus on history and anthropology. Berlin is ideal for museum lovers like myself because of its Museum Island, a cluster of museums on the northern half of an island in the Spree River, right in the middle of the city. Museum Island consists of five museums, each with a different focus and each housed in a magnificent building. For example, the Neues has Egyptian and prehistoric collections, the Pergamon has ancient Middle Eastern artifacts while the Alte Nationalgalerie (Old National Gallery) holds 19th-century artwork. I didn’t have time to visit all of these museums so I chose the Neues (New) Museum, which despite its name was built in 1859. It’s new compared to the neighboring Altes (Old) Museum was built in 1830. The Neues Museum featured a great Egyptian collection featuring mummies, tombs, papyrus scrolls, and busts of pharaohs, as well as Germanic and Celtic exhibitions. I also wanted to visit a museum about German history so immediately afterwards, I went to the German Historical Museum, which is just down the road from Museum Island. The museum features cool suits of medieval knight armor and weaponry, medieval paintings of battles and royalty, German cars, as well as World War II posters and newspaper clippings. However, I wasn’t able to see everything since the museum was about to close so I missed out on a few of the exhibits. Also on Museum Island is the Berlin Cathedral, a neat fortress-like Protestant church with a massive green dome flanked by two smaller green domes. The domes remind me of Orthodox churches and the Kremlin. Built in 1905, the Berlin Cathedral actually isn’t very old and isn’t even a proper cathedral because it’s not the seat of a bishop. Earlier that day, I had visited a friend in a scenic residential part of town, that had a park with horses and a barn nearby as well as a horseshoe-shaped housing complex. While the inner parts of Berlin, like the one I was staying in, seem rather gritty and gray, the residential neighborhood was like a whole different world. I wish I could have spent longer in Berlin. Ancient elk skeleton, found in Berlin, dating from 10,700 BC! Milan might be Italy’s most prosperous and modern city but it also boasts several impressive historical sights. These include the massive Duomo cathedral, Sforza Castle or Castello Sforzesco, and the Basilica of Sant’Ambrogio, a 1,600-year-old Roman church. Sforza Castle is a handsome brownish-red castle that was built in the 15th century by the Duke of Milan that was one of Europe’s largest citadels at one point. The great Leonardo da Vinci decorated part of the interior. It boasts a central tower that looms high above the walls of the castle, which is built in a quadrangular shape. Inside, the castle is divided into three courtyards, the main one, and the smaller Ducale and Rocchetta. Nowadays, the castle is also a giant museum complex, housing several connected museums that feature paintings, medieval weapons, musical instruments, tapestries, antique furniture, prehistoric artifacts, and even Egyptian artifacts. There is even the last work of the great Michelangelo, an unfinished marble sculpture of the Virgin Mary carrying Jesus’ dead body. It is an impressive diverse collection of exhibits that lets you explore the castle, while appreciating great art and artifacts and learning about Milanese history. I do find having museums inside a castle is a great way to make use of such a historic building while allowing visitors to double up on their enjoyment. Even if these museums weren’t in this castle, they would be worth checking out. The castle is also used as venue for events like a vintage car show that was going on when I visited, which included sports cars from the 1960s and 1970s and antique pre-World War II cars. The castle is in Sempione Park, that also features an aquarium and a modern museum, which unfortunately I didn’t visit. Built in 379–386, the Basilica of Sant’Ambrogio is a Roman-era church that is also brownish-red, similar to Sforza Castle. As befitting one of Milan’s main churches, the basilica is quite elegant with a smooth exterior, which again is similar to Sforza Castle. It features a triangular roof and a portico with arches with an enclosed open courtyard in front of it, flanked by two bell towers on either side. The shorter tower was built in the 9th century while the other one was built in the mid-12th century. Inside, the crypt features the remains of three saints – Ambrose, who the church is named after, Gervasus and Protasus. How to get there: For Sforza Castle, get off at Cairoli Castello subway station on the Red Line or Lanza station on the Green Line. For Basilica of Sant’Ambroglio, get off at S. Ambrogio subway station on the Green Line. Rome is famous for great historic sites such as the Colosseum and the Roman Forum, but what makes it a fantastic city is that there are many more sites across the city. A lot of the sights are close to each other, such as the Colosseum and the Roman Forum and Capitoline Hill, and there are entire neighborhoods or districts that are full of landmarks. A lot of other cities have famous sites but when you visit those sites, there isn’t much to see in the immediate vicinity. In Rome, the famous sites are often next to other interesting sites, and the surroundings are filled with beautiful and historic buildings. 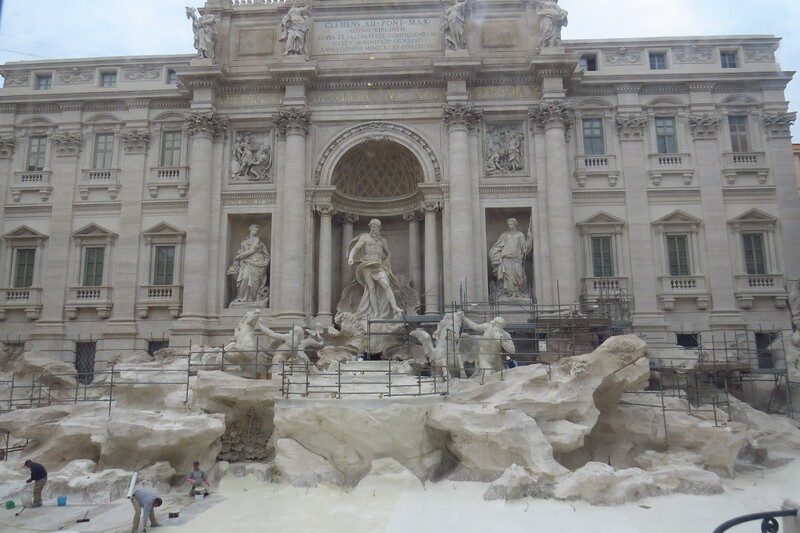 Besides the Colosseum and the Forum, two of Rome’s most well-known tourist attractions are the Spanish Steps and Trevi Fountain. Both are east of the Via del Corso, a straight street that was built by the Romans (from the Roman empire, not the present) and within 15 minutes from each other. 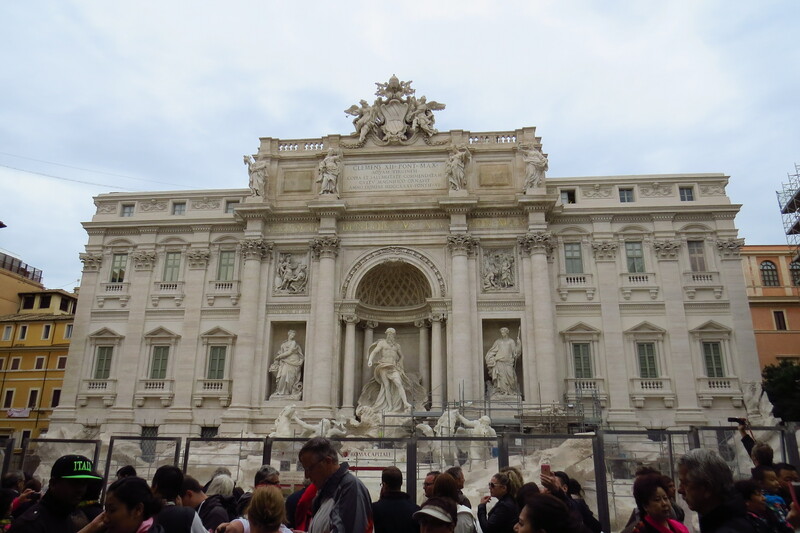 Unfortunately, they were both undergoing renovations when I was there so it was underwhelming, but still crowded. The Pantheon is to the west of the Via del Corso, while not far away is the Piazza Navona, a superb square built by the Romans in the 1st century AD and surrounded by historic buildings with an obelisk and beautiful fountains in the center. The Pantheon is a former Roman temple, from 126 AD, with a domed ceiling with an occulus (central hole in the middle of it). It is incredibly well preserved, simply because it has been in continual use as a place of worship. Crossing the Tiber took me to the Castel Sant’Angelo, a castle built by the Emperor Hadrian in 129 AD. The top of the castle gives you fine views of the River Tiber and the Vatican, with St Peter’s Basilica visible.